What began with a crack in the road has now become a four mile stretch of volcanic fissures cutting through residential communities on Hawai’i Island. HPR Reporter Ku‘uwehi Hiraishi is on the ground in Puna and filed this report. For more than a week now, volcanic fissures have been breaking through the ground in the residential communityof Leilani Estates, So far, 18 fissures have been opened—some shooting lava as high as 200 feet in the air. "It’s hard to get people not to come in, because it is an amazing sight." Major Jeff Hickman and members of the Hawai’i Army National Guard coordinated access to a recently spewing fissure along Kilauea’s East Rift Zone. "Hey good morning everybody, my name is Sergeant Milo Kalama. 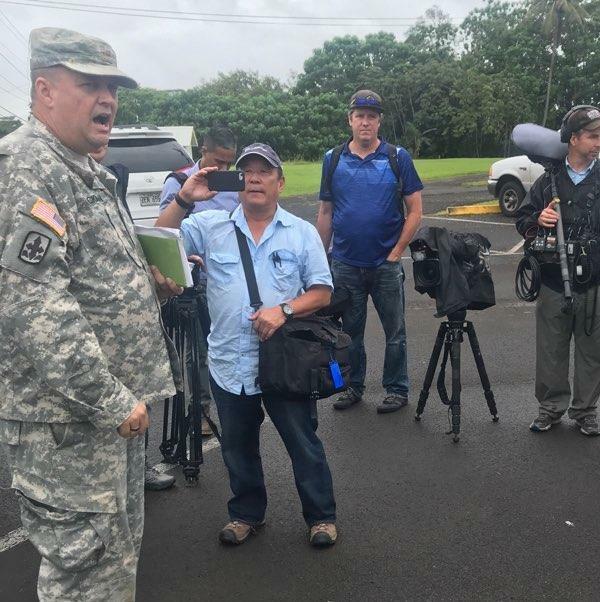 I’m with the 93rdcivil support team…"
During the media safety briefing, Major Jeff Hickman (left) said, "The monitors are on this gentleman. If you see him run. You run." After a quick safety briefing from our national guard escorts, we were fissure-bound in hopes of catching a glimpse of Pele in action. Leilani Estates is situated nearly 25 miles away from the summit of Kilauea Volcano. In the past week, lava from these fissures has covered nearly 130 miles of land, destroying 26 homes. HICKMAN: It’s very hard because we can’t predict anything. We’ve got weather conditions, we’ve got mother nature and Pele. She’s gonna do what she’s gonna do. As our vehicles pull up to fissure number 13, steam and sulfur dioxide can be seen rising from the cracks in the ground. 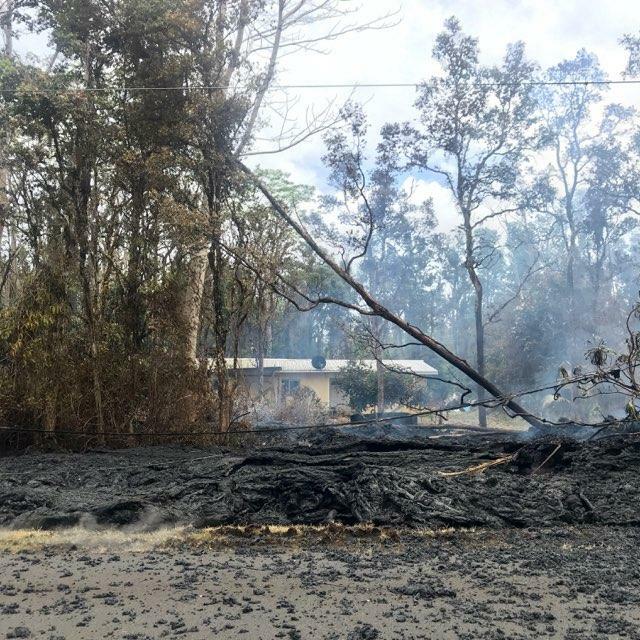 A bed of fresh lava, 100 yards long lay across Leilani Avenue leaving charred ‘ohi’a trees and partially burnt telephone poles in its path. HICKMAN: As amazing as it is, it’s also destructive and it’s affected people in the Leilani area in a way that nobody can really comprehend. We get out of our vehicles and approach what looks like a war zone. The feeling of cool, crisp air on our faces soon hits a wall of heat. The smell of rainforest vegetation now reeks of rotten eggs or sulfur dioxide. HICKMAN: My guy said if I run, you run, k? Cause we’re going in without masks. When they sense the one part per million we have to leave. 5 parts per million we run. KALAMA: Right here is 0.2 PPM. Shards of lava crunch like glass with every step we make toward the fissure. We soon discover a house behind the thick of ohi’a trees, just 20 yards from the lava flow. A house Pele spared, for now. HICKMAN: K, let’s go, let’s go! When he says go, we gotta go. UNIDENTIFIED VOICE: Who’s bag is that? HICKMAN: K, back up, back up. The fissure tour got cut short. It turns out as we were admiring both the wondrous and dangerous power of Pele, she decided to break through the ground up the road.